We get it. And understand your frustration. 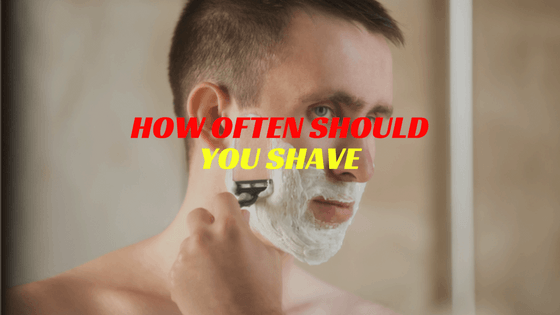 And in this article we are going cover all the necessary details about how often should you shave and what common things you should do. We also going to share some fun facts about shaving at the end of this section. Before we go into that specific " How Often Should You Shave " answer, we have to analyze some history of shaving with some rituals. Back in the days, ( we are talking about few hundred years ) people were fighting to overcome his beard. In general, the hair grows between 125mm to 150mm per year. If you calculate all this, it seems that average man spend 3000 hours of his life shaving them. Quite irritating right? Even at the time of Alexander, people used to shave it so that the enemy can’t grab their hair in hand to hand combat. Then again, various cultures all over the world like Persians, Greeks, and Egyptians considered having a beard is a sign of masculinity and social power. As century evolved and modern generation step up, people started to give emphasize to beard. Today, you will see a different picture than 50’s or 60’s. Society accepted beard as a symbol of manliness. And it’s great. However, there are still people out there who love to have a clean shaved face. That’s a completely different scenario and we are not saying it is bad at all. There are many circumstances in our day to day life where we have to look clean. For example, if we work in a strict corporate culture, we are bound to be looking fresh instead of manliness. Whether you prefer shaving or not, the role of the clean face will always be a symbol of freshness and professional. So the question comes again.. There are mainly two criteria we set for this task. Ask this question: what is my priority? If you really want to look fresh (reason can be whatever) on a daily basis, you got to add shaving in your daily routine. Cleaning your face in the morning makes you more fresh and clean for the whole day. There is a reason we prefer this rule. The number one reason is you will be allowed to heal from the brunt of shaving. If you have a sensitive skin, You are more likely to get irritation from daily shaving. In particular situation, your hair may grow really fast. For example, I have one uncle in my neighborhood who regularly shaves his beard. His facial hair grows very fast and he cannot help himself apart from taking the razor in the morning. So in that case, going daily is the only option we recommend. Do not just stick to what we say. Actually how often you shave comes down to some key points depending upon your geographical area and culture, your jobs description etc. Many people start to see facial hairs after the puberty period like at the age of 16 or 17. If it’s you, do not be shy. You can always go for once a week method. What we like to say is, run your day to day life till Saturday and do a complete clean up on Sunday. Once you do that, you are set for the whole week again. So How And When Should I Shave Then? Well, see and imagine yourself. Look at the above category and resonate in which category you fall. And decide depending upon your daily routine and schedule. It’s simple. ->A fresh look : as always, clean shaving man look very professional and fresh compared to a fully beard grown man. You can feel the difference. Just stand in-front of the mirror and you will see the vast change immediately. ->Personal Hygiene: there are several studies have been done in the past which represents that few bacteria do presents in facial hair. So a clear face makes a man more hygienic compared to a beard man. ->Better Chance At Profession: This is really something that we want to cover. In order to grow as a person, we also need to grow financial wise. To achieve it, we need to move up in our carrier. There are some corporate culture where company do not allow beard for the vary business purpose and if you are one of them, it can be a great add on in your chance of growing. Clean people tend to look more attractive and smart. So they have a high chance of get hiring or promoting. ->Feel easy in the summer : You know what irritates us most? The summer. If you growing a beard, you will understand what we are talking. During the summer, it is become pretty hard to keep a beard in maintenance. To the clean shavers, you are in great relief by the way. Every action has some opposite reaction. Is not it? Cut your skin: you need to take special care for your skin while shaving. Lot of people end up cutting their skin due to improper handling or similar cause. We know you are going to need the razor on a daily basis. So keeping an eye might save you from future cuts. Razor Burn: It is common. Using a blunt blade, or applying more pressure to remove hair, or using an improper method of shaving can lead to razor burn. For the most sensitive skin, it is one of the major problems we have found yet. To avoid razor burn it is advisable to use a moisturizing shaving gel. - 0.35 millimeters a day or 1 centimeter per month is the rate at which human hair grows. - A man (in general) shaves at least 20000 time in his life circle. - Men’s facial hair grows at a rate of approximately half an inch per month (6 inches per year). - About 85 percent people like wet shaving. - Hair growth rate is faster in DAY compare to Night. - The average shave lasts 3.5 minutes. - From 18 to 25 ages, people shave at least four times a week. - About 30% of men who shave use an electric device to shave. Question : How should I shave? With or against the grain? Answer: first, understand that the vast majority of the facial hair grows differently in different areas. So there is no specific answer to the question. However, majority of your shaving should be done in the direction of hair growth. Most commonly downwards. More often, you will find that you have to shave against the grain at the end of a shaving. Question : What to use prior to shaving? Different people will tell you different stories. However, we want focus on particular things. If you shave regularly, we advise that you use a shaving cream as it is more targeted towards the particular task. A soap generally do the work but the smoothens you feel using a cream is nowhere near by using a soap. Question : I encounter with razor burn. Help me. Answer: This is so common in shaving. Most of the people face this problem during their shaving life. Before you solve this problem, know the problem. Razor burn is an irritation of the skin caused by using a blunt blade or not using proper technique. The longevity of razor burn may see from a few hours to a few days. To prevent this, use/hydrate the skin prior to clean up. Use moisturizing shaving gel, or shave in the direction of the hair growth. Question : Should I start shaving as soon as I notice hair growing on my face? Answer: it depends. No one can answer that for you. Beards or facial hair try to show up differently for different person. Some may see it mid to late teenage years and some people see it at the end of 20 +. We recommend that if you are complete teenager and seeing some beard growth, do not panic. Let it grow naturally for few weeks and then clean if off. There are hundreds of products in the market for the shavers. We can recommend only what we believe is best and use it on our own purpose. Below you will find some handy pack of clean shaving tool. Go and check it out if you have not already. We have found a better options for you. Already shaving and getting razor burn? Fed up with your morning shaving routine? Welcome to the world of stubble. We already mentioned in our previous article why keeping a stubble beard looks more attractive.. Moreover, there are zero chances of razor burn. A stubble trimmer will never hurt your skin. Plus, you can do it in the shower and anytime during the day you want. Now, you grasp all the information related to how often you should shave, it’s time to act. Let us know in the comment section what you have decided to do and why? We also need your full support. If you found this article helpful, please share it with your friend circle. Let us help him to look good as you. I do shave daily basis. After reading this article i will be showing down my shaving speed.